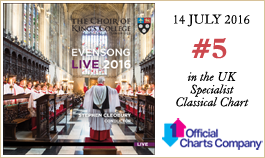 Evensong Live 2016 is a selection of the best weekly webcasts, as selected by the choir’s Director of Music, Stephen Cleobury, from the recordings made during the preceding academic year (2014-15). Services at King’s College Chapel are recorded using a state-of-the-art recording system concealed in the roof, vestry and organ loft. 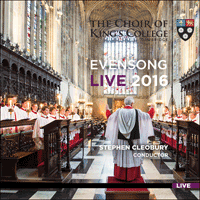 The fifteen compositions presented on this disc were all recorded live at services sung in the Chapel of King’s College during the Lent and Easter Terms 2014 and 2015. The daily Offices of Morning and Evening Prayer (Matins and Evensong) were in print and in established use before the publication in 1549 of Thomas Cranmer’s The Booke of the Common Prayer, but their position there at the very beginning of the book reflects their growing primacy in the patterns of vernacular worship in Reformation England. Both were derived from a conflation of the services, or ‘hours’, of the medieval Latin liturgy: in the case of Evensong, parts of the services of Vespers and Compline were brought together to create a liturgy which is revered by many, believers and non-believers alike, as perhaps the quintessential expression of Anglicanism. At the heart of Evensong lie the Psalms appointed for the day and the unchanging canticles Magnificat (Mary’s response to her cousin Elizabeth: Luke 1: 46–55) and Nunc dimittis (the Song of Simeon: Luke 2: 29–32), all of which surround the reading of two Lessons, from the Old and New Testaments respectively. The composition of settings of the two canticles for use at Evensong reaches back to the sixteenth century and remains a vibrant genre of Anglican composition today. The three Magnificat settings (Tracks 2, 9, 11) included here reflect the range of responses which Mary’s words may inspire: the quiet, and relatively constant or ‘neutral’ mood of Stanford’s 1902 setting, its solo soprano or treble clearly evoking the original speaker, is in stark contrast, for example, to the much more personal response of Tippett, its vocal melismas on words such as ‘rejoiced’ and ‘holy’ seeking to convey a sense of ecstatic joy. The Tippett and Howells settings further reflect a response not just to a given text, but to a given place, each having been composed for a specific choir and building. Tippett’s setting for George Guest and the Choir of St John’s College, Cambridge was composed in 1961, for the occasion of the College’s 450th anniversary; it was first performed in the College Chapel on 13 March 1962, the prominent fanfare motives in the organ part having supposedly been inspired by Tippett ’s admiration for the trompeta real stop on the St John’s organ. Herbert Howells’s 1946 ‘Gloucester’ canticles are one of his many such settings for specific buildings and forces, including both King’s and St John’s Colleges (he was acting organist at St John’s during the Second World War); perhaps nothing evokes the soaring architecture of Gloucester Cathedral so much as the climactic treble entry at ‘As it was in the beginning’ in the ‘Gloria’, which recurs at the end of the Nunc dimittis. The earliest music recorded here is Christopher Tye’s anthem Laudate nomen Domini (Track 7). Tye received the degree of Bachelor of Music at Cambridge in 1536, and sang as a Lay Clerk in King’s in the period March 1537–February 1538, though it is unlikely that any of his surviving music dates from his period of association with the College. The musical source for this well-known piece is Tye’s 1553 publication The Actes of the Apostles, a rendering of that New Testament book in metrical verse together with a musical setting for each chapter. The music for ‘Laudate nomen’ is the setting for Chapter 4 in Tye’s version; however, the Latin text with which the music is now generally associated is a later anonymous contrafactum, or substitute text, being a paraphrase of the first verse of Psalm 112; an English translation of this, beginning ‘O come, ye servants of the Lord’, is also frequently encountered. The largely homophonic and syllabic word setting in ‘Laudate nomen’ aptly responds to Cranmer’s ideal, as expressed in a letter of 1544 to Henry VIII, that musical settings of sacred texts should not be florid or melismatic, but rather that there should be ‘as near as may be, for every syllable a note’. The same characteristic is found in Orlando Gibbons’s verse anthem This is the record of John (Track 6), in which each of the three solo declamations of the text is complemented by a choral response. Gibbons was a member of the College and Choir in the late 1590s (his elder brother Edward served as Master of the Choristers between 1592 and 1598). Accompanied here on the College’s fine 2012 Klop chamber organ—the original accompaniment was for viol consort—Gibbons’s setting is remarkable for the naturalness of the fit between words and melody in the solo sections: indeed, the experience for the soloist can be almost that of articulating heightened speech (‘… and he said, ...’), rather than singing in the ordinary sense. The rubrics for Evensong of the 1549 prayer book and its 1559 revision have little to say about music beyond observing that certain elements (including the Lessons) may be ‘saied or song’. It was the post-Restoration 1662 Book of Common-Prayer which first included the instruction, following the Third Collect (‘Lighten our darkness’), that ‘In Quires and Places where they sing, here followeth the Anthem’. It was the 1662 service that would become familiar to the then three-year-old Henry Purcell, whose five-part Latin setting of Psalm 3, Jehova, quam multi sunt hostes mei (Track 5), demonstrates a much more vivid, indeed theatrical (Purcell was to compose the first great English opera, Dido and Aeneas) approach to text setting: this is real ‘word painting’. It must be doubtful, though, whether Purcell’s composition, dating from around 1680, was directed toward Anglican use in the England of his time, and it has been conjectured that the piece may have been intended for the Catholic chapel of Catherine of Modena, daughter of the future James II and his Catholic wife Mary. The works by Tye, Gibbons and Purcell all exemplify the tradition that the text of an anthem would usually derive from a biblical or liturgical source. That restriction, along with Cranmer’s injunction against musical complexity, has of course long been repudiated, to the enormous enrichment of the tradition. Nor has the ‘anthem’, in the sense of the 1662 rubric, remained the only place in the structure of Evensong at which unspecified choral music may be introduced. It is traditional at King’s and in many cathedrals for the service to begin with a short choral Introit preceding the spoken Sentences. Compositions such as Tye’s Laudate nomen or Kenneth Leighton’s Drop, drop slow tears (Track 8) are suitable to either position. The text of Leighton’s work is taken from Phineas Fletcher’s Poetical Miscellanies of 1633. Fletcher was an almost exact contemporary of Gibbons, and was educated at Eton and King’s, to which he came up in 1600. The best-known setting of these words is, in fact, probably that by Gibbons himself, which has entered the canon of Anglican hymnary sung to Gibbons’s Song 46. Anthem composers of the twentieth century and later have found particularly rich stimulus in English poetry, especially the works of the metaphysical poets of the seventeenth century. Parry’s At the round earth’s imagined corners (Track 1) sets one of the sonnets from John Donne’s Divine Meditations, published posthumously in the same year as Fletcher’s Miscellanies. It is the fifth of Parry’s six Songs of Farewell, composed in the last years of his life and published in 1918, the year of his death. The scoring expands from simple SATB in the first setting (My soul, there is a country, the best-known of the set) to SSAATTBB in the last (Lord, let me know mine end); the Donne setting is in seven parts, SSAATBB, which allows for wonderfully rich scoring of the unusually advanced chromatic harmony and counterpoint which these magnificent words drew from Parry. His final years were clouded by unhappiness and depression, brought on not least by his reaction to the First World War; while Donne’s sonnet is a vision of the Last Judgement, it is not difficult to imagine that the images of ‘scattered bodies’ and the closing idea of pardon purchased through the shedding of blood (the unexpected repeat of ‘as if Thou’dst sealed …‘, following what might have seemed the final cadence, brings the piece to a gently ambiguous harmonic close) might have carried much more immediate, human resonances for the composer. The gradual thickening of choral textures across Parry’s six Songs also shapes the setting by Judith Weir (KC 1973; one of the first women to read Music at King’s, and since 2014 Master of the Queen’s Music) of the words of another metaphysical poet, George Herbert. Vertue (Track 14) is the first of a series of three Herbert settings published in 2005. Of the poem, John Drury (KC 1981; Dean of Chapel, 1981–91) has written in his study of Herbert’s works, Music at Midnight, that the reference to music in the third verse suggests that the poem ‘is a song. One easy tune, with little changes here and there as it goes, would fit each verse.’ Weir’s ‘tune’ can hardly be described as easy; but the audible melodic and rhythmic relationships between the setting of each verse, as the texture expands from two to three to four, and finally to six voices, demonstrate the aptness of Drury’s insight. The shadow of the Second World War, rather than the First, would have hung over the audience at the 1942 premiere of Vaughan Williams’s motet Valiant-for-Truth (Track 3), setting not seventeenth-century poetry but the prose of John Bunyan. Vaughan Williams, much drawn to Bunyan’s work, chose the well-known passage near the end of the second part of The Pilgrim’s Progress, setting it in two broad sections each of which opens with the altos (or countertenors) functioning as the narrator, although this role subsequently passes to the soprano (treble) part. The full ensemble is used for the passages of direct speech, as also for the closing evocation of trumpets, to which Vaughan Williams brings emphatic repetition of text and stark block harmonies. A narrative role for a solo singer is also a conspicuous feature of George Benjamin’s (KC 1978) setting of a text from Isaiah 6, ‘Twas in the year that King Uzziah died (Track 12). Benjamin composed the piece in 1980 and dedicated it to Philip Radcliffe (KC 1924; Fellow in Music, 1931–37 and 1947–86), whose own music has a special place in the repertory at King’s. The solo tenor part, reaching at one point to a top A#, was probably inspired by the presence in the choir at the time of Choral Scholar Charles Daniels, whose spectacular high range and pure timbre have remained distinctive. Just as conspicuous, if not more so, is Benjamin’s adventurous exploration of the colours and possibilities afforded by the Chapel organ: the full range of effects is explored, including, near the end, the singular combination of a 4’ flute stop with the tremulant. Benjamin’s writing for the instrument is clearly influenced by the music of his teacher Olivier Messiaen, with whom he studied before coming to Cambridge; it is thus appropriate that this album includes Messiaen’s own short, unaccompanied 1937 Communion motet O sacrum convivium (Track 10), the text possibly the work of Thomas Aquinas. The climactic ‘Alleluia’ of Messiaen’s work offers another link to Benjamin’s, in which the same word seals the vision of heaven that has been so richly evoked. The remaining three works are each connected liturgically to Offices other than Evensong. Magnificamus (Track 13) is the concluding movement of a Vespers sequence, Lit by holy fire, composed by Francis Grier (KC 1973; Organ Scholar) to texts drawn from the Psalms (here Psalms 65 and 96) and newly written by Elizabeth Cook. As Grier puts it, the Psalm verses ‘were selected to create an implicit psychological/spiritual narrative. The movement is from a sense of dissonance and rebellion at the way of things, through a discovery of sanctuary to a spirit of joyful praise in which the inherent radiance of the Creation sings out’. Magnificamus follows a setting of Magnificat itself and uses the full resources of the Choir, dividing into twelve parts for the C major chord with added notes, spread across three octaves, which concludes this ‘declaration of praise from the whole of creation’. William Walton’s Jubilate (Track 4) is a lively setting of Psalm 100 using, despite its title, Coverdale’s English translation rather than the Latin Vulgate text. This Psalm was established in the 1559 Prayer Book as an alternative to the canticle Benedictus, to be sung following the Second Lesson at Matins. Walton’s setting dates from 1972, when it was given its first performance at his alma mater, Christchurch, Oxford, conducted by Simon Preston (KC 1958; Organ Scholar). Matins, too, is the proper home of the early Christian hymn Te Deum laudamus, appointed in 1549 to be sung after the First Lesson. But it is also used occasionally as the climax of a Festal Evensong, and on other occasions. The performance of Herbert Howells’s 1944 setting (Track 15) recorded here was given in a special service of music and readings on 20 January 2015 which formed a part of the College celebrations of the five hundredth anniversary of the completion of the Chapel fabric. On this occasion the Chapel Choir was joined by King’s Voices, the mixed-voice ensemble formed in 1997 which, conducted by Ben Parry, regularly sings Evensong on Mondays during Full Term and on other occasions. Howells’s ‘Collegium Regale’ settings of the Te Deum and Jubilate were the first of his celebrated compositions for the College; apparently the consequence of a one-guinea bet with Eric Milner-White (Dean of Chapel, 1918–41), they were followed in 1945 by the Magnificat and Nunc dimittis, and a decade later by the setting of the Communion service. As Sir David Willcocks (KC 1939; Organist and Director of Music, 1957–74) later recalled, when asked to compose for a particular building Howells would take time to attend a service and to acquire a feel for the acoustic and character of the space before beginning to write. The acoustic of King’s Chapel is merely one of its many glories; it is magisterially harnessed to Howells’s response to this substantial text, the closing lines of which can be interpreted in significantly contrasting ways. The key word for Howells may have been ‘trust’ (one thinks of his later hymn tune ‘Michael’, to the words of Robert Bridges’s ‘All my hope on God is founded’): it marks a musical turning point following which the setting mounts inexorably to its thrilling conclusion, as though all that has been prayed for had already been granted.